Where do I use my Healthspan voucher code? Healthspan sell a huge array of vitamins and supplements including amino acids, cannabis oil (CBD), chondroitin, coenzyme Q10, cod liver oil, fish oils, garlic, ginkgo, ginseng, glucosamine, herbal supplements, krill oils, minerals, multivitamins, magnesium supplements, omega 3, omega oils, plant sterols, probiotics, prebiotics, protein, turmeric, vitamins and vitamin sprays. As well as this Healthspan also provide body skin care, facial skin care, hair care, hand and nail care, replenish products, skin supplements and sun protection. If you’re looking for pet supplements you can find a huge supply of this too with cat, dog and equine health products for all needs and health issues. If you’re shopping for nutrition you can find a wide selection of active, elite and personalised nutrition including breakfast, daily essentials, healthy snacks, exercise nutrition, night-time nutrition, protein, personalised proteins and multivitamins. There’s also a great selection of food and drinks available including YoGo, gummies, nutrition bars, eat well boxes, HiLo bars, Delice Noir, porridge and cookies. Healthspan allows you to personalise your nutrition and fitness journey with their free app. Use the NutriCoach devices to help keep you on track with your goals, log your food in each day to monitor your diet and use your personal information to tailor your multivitamin, protein and electrolytes. The Healthspan app reiterates Healthspan’s core beliefs that you should maintain a healthy lifestyle rather than taking part in ‘fad’ diets with their easy to use features that will support you on your personal journey. The app focuses on three key pillars – staying active, eating well and being positive, allowing you to track your macros, calories and exercise for the rest of your life. As well as an impressive selection of products, Healthspan also has a great advice section. In this section you can find guidance and solutions on staying active, eating well and being positive with posts on how to keep a balanced diet, how to keep your mind active, how to increase performance and avoid injury and much more. In the advice section, you can also discover advice on how to lead a healthier life with topics on all things health and fitness as well as a handy blog that’s updated regularly. 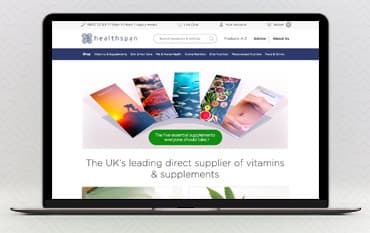 Healthspan is the UK’s leading direct supplier of vitamins and supplements providing a huge range of skin, hair care, pet and horse supplements as well as active, elite and personalised nutrition, plus food, drink and much more. Shop online at Healthspan and enjoy great savings on all these products with a Healthspan discount code from us, you can also enjoy great savings when you subscribe and save, refer a friend or download the Healthspan app.